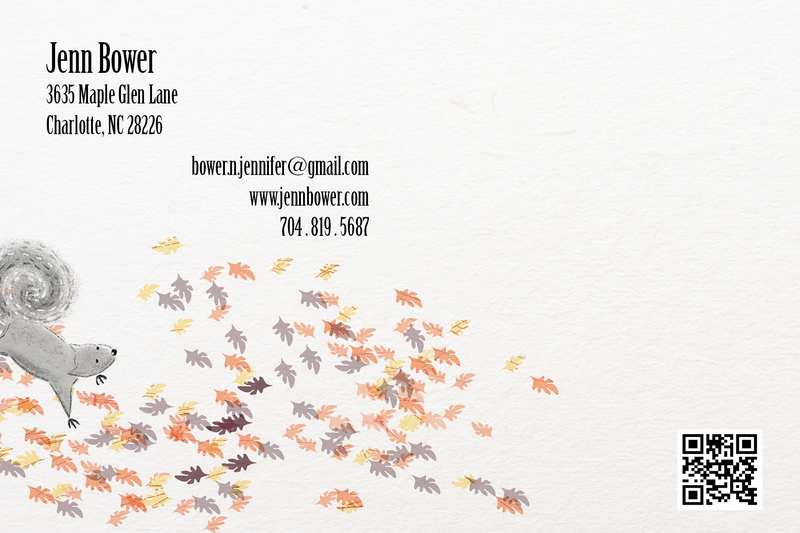 Jenn Bower loves crafting characters, one line at a time, while sniffing markers and eating her crayons. She gave up paste in college. The rubber cement fumes went to her head. 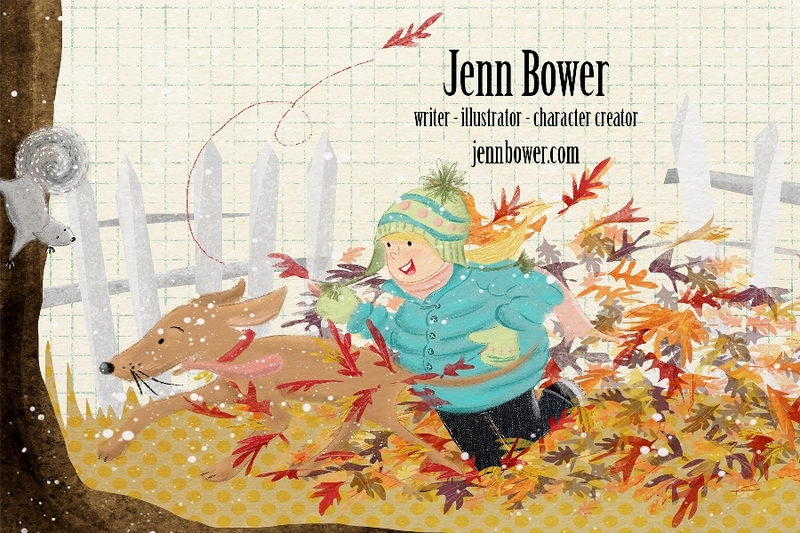 An ‘authorstrator’ (thanks Jen Hill) from North Carolina she loves working on picture book and middle grade illustrations, character development and her own story ideas. Jenn is an active member of the SCBWI-Carolinas regional chapter, attended UNC-Chapel Hill for Journalism & Advertising and earned her BFA-Interior Design from Winthrop University. Her heroes are the Provensens, Leo Espinosa, Dan Yaccarino, Bill Peet, J P Miller, vintage Golden Books, Jack Ezra Keats, and early Disney animation. She works with digital techniques to replicate the look of pencil, gouache, crayon, and cut paper. A mother of one active teen, a Doberman/Hound puppy, an *EXTRA* large cat and a Budgie bird she is constantly corralling the food chain and keeping the house clean. Postcard front. Seasonal indeed! This makes me really miss my native New England. Most of the time it is a detailed section of a new portfolio piece. In all my work I try to tell stories so there is always a good bit of “action, reaction & interaction”* going on. I do like to keep the images seasonal, if possible. It just helps me stay on track. Sometimes it is a character design that has recently popped into my sketchbook. I have a petulant redheaded little boy that I am dying to get out on a postcard. *Note to self: remember the A-R-I. Hmmmm. I was going to say art and name only on the front, but then I looked at my most recent promo piece and saw that it had image, name, tagline & web address on the front. I think art and your name or web address are the most important elements for the front. The art is what sells. Then you want to make it as easy as possible for the AD/Editor/Agent to find you. I’ve heard that if they love the art you get pinned on a reference board. * I want my image and name to stand out from ten feet away. *I’ve heard this too. Fingers crossed. Beautiful use of space on the postcard back. Love that squirrel checking out Jenn’s info! No, not really. I struggle with thinking that small. I typically select images based on what is getting a lot of buzz. September of 2012 my promo card was a section of an image that won 3rd place in the SCBWI-Carolinas art contest. * It was the promo card I took to the fall conference and I made sure it was my Facebook, Blog & Twitter banner image. For the 4th quarter I do try and create a holiday inspired postcard. Typically stand-alone images but they do tend to be seasonal in theme. *I love how you share the progession of your illustration on your blog. Postcards work really well as leave-behinds and to give away at conferences. Great conference prep, Jenn! 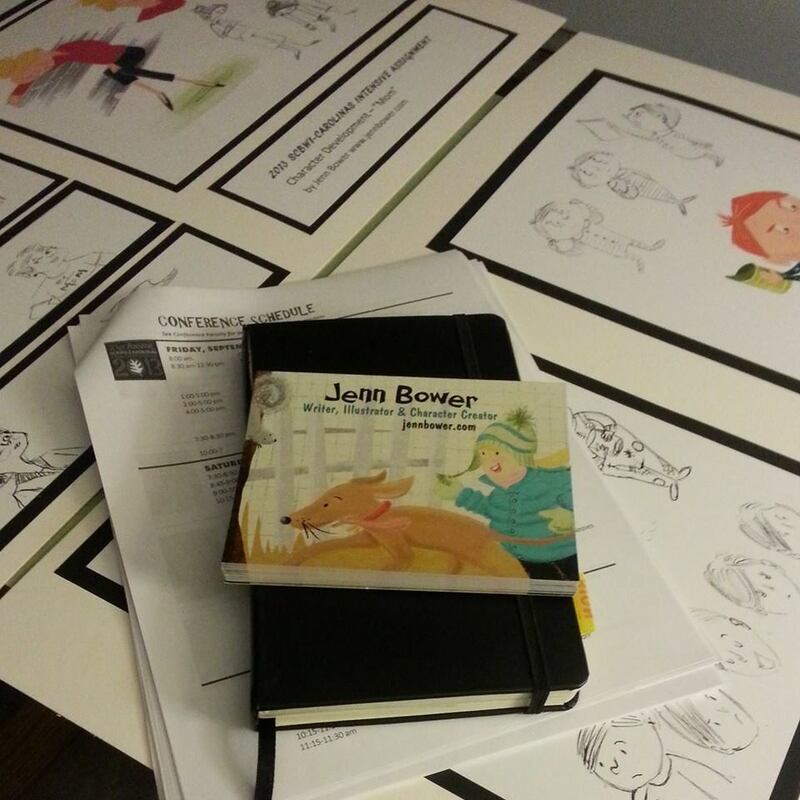 I use THE BOOK that is available to SCBWI members. * I have to keep things simple so right now I am targeting agents, creative directors and editors but only at the agencies that I feel would be a great partnership; and to the publishing houses where I feel my body of work would fit. I go to the bookstore and library and write down the names of publishers whose books are nearest to my style** and try to mail them at least four times a year. * another good reason to join the SCBWI. I spend too much time at the computer as it is so I go analog with this part of the process. I print out the listings from THE BOOK and hit the addresses I want to target with a highlighter, then I hand write the labels. I don’t know, I just think there is something genuine about a handwritten note,* even if it is just the mailing label. *so nice because it is so rare these days! *blerg* Yes. “KISS”* I’ve learned this the very hard way. I am self-taught in Photoshop so I have found the simpler I keep things the better my results. I truly use the software as if it were paper, paint and brush. I try not to use too many layers. I am relying less on the ‘undo button’ and I don’t use many filters or adjustments other than opacity. SAVE!!!! Yes, that is a crucial step in the digital process. Save often. ** Also, I am playing more with scanning in analog elements, like line work. I tend to be a bit ham-handed when I work digitally so warm up exercises with pencil, ink, gouache, colored pencil are crucial to me. I’ve used GotPrint with great results, but lately I have also had great success with VistaPrint. I just pay a little extra for the thicker card stock. Thanks so much for sharing all this great info, Jenn. I love the squirrel in the leaves. Looks just like my own backyard! Great interview, love the additional little asterik-comments, you introduced me to another awesome authorstrator AND the stuff she shared was totally on the mark, especially the handwriting PCs part, love that. I’m goin’ to find her on Twitter right now! Thanks for the lovely comments, everyone. Jenn’s work is fantastic and I had a lot of fun with this interview.